The enteroaggregative E. coli heat-stable enterotoxin 1 (EAST1) encoded by astA gene has been found in enteropathogenic E. coli (EPEC) strains. However, it is not sufficient to simply probe strains with an astA gene probe due to the existence of astA mutants (type 1 and type 2 SHEAST) and EAST1 variants (EAST1 v1-4). In this study, 222 EPEC (70 typical and 152 atypical) isolates were tested for the presence of the astA gene sequence by PCR and sequencing. The astA gene was amplified from 54 strains, 11 typical and 43 atypical. Sequence analysis of the PCR products showed that 25 strains, 7 typical and 18 atypical, had an intact astA gene. A subgroup of 7 atypical strains had a variant type of the astA gene sequence, with four non-synonymous nucleotide substitutions. The remaining 22 strains had mutated astA gene with nucleotide deletions or substitutions in the first 8 codons. The RT-PCR results showed that the astA gene was transcribed only by the strains carrying either the intact or the variant type of the astA gene sequence. Southern blot analysis indicated that astA is located in EAF plasmid in typical strains, and in plasmids of similar size in atypical strains. Strains carrying intact astA genes were more frequently found in diarrheic children than in non-diarrheic children (p < 0.05). In conclusion, our data suggest that the presence of an intact astA gene may represent an additional virulence determinant in both EPEC groups. Enteropathogenic Escherichia coli (EPEC) are an important cause of infant diarrhea in developing countries . The majority of EPEC isolates belong to classic serotypes derived from 12 classical O serogroups (O26, O55, O86, O111, O114, O119, O125, O126, O127, O128, O142, and O158) [2, 3]. EPEC induces attaching and effacing (A/E) lesions on epithelial cells, characterized by microvilli destruction, cytoskeleton rearrangement, and the formation of a pedestal-like structure at the site of bacterial contact . The A/E genes are localized to the locus for enterocyte effacement (LEE) and encode intimin, a type III secretion system, secreted proteins and the translocated intimin receptor [5–7]. “Typical” EPEC strains (tEPEC) contain also the EPEC adherence factor (EAF) plasmid , which carries genes encoding a regulator (per)  and the bundle-forming pili (BFP) . EPEC strains lacking the EAF plasmid have been designated “atypical” EPEC (aEPEC) . Recent epidemiological studies indicate that aEPEC are more prevalent than tEPEC in both developed and developing countries . Some aEPEC strains are genetically related to the enterohemorrhagic E. coli (EHEC), and both are considered as emerging pathogens . Typical EPEC strains express only the virulence factors encoded by the LEE region and the EAF plasmid, with the exception of the cytolethal distending toxin produced by O86:H34 strains and the enteroaggregative heat-stable enterotoxin 1 (EAST1) found in O55:H6 and O127:H6 strains. In contrast, aEPEC strains frequently express EAST1 and additional virulence factors not encoded by LEE region . In a previous study , EAST1 was the most frequent (24%) virulence factor found in a collection of 65 aEPEC strains, and was significantly associated with children diarrhea. EAST1-positive aEPEC strains have been associated with outbreaks of diarrhea involving children and adults in the United State  and Japan . However, it is not sufficient to simply probe strains with an astA gene probe due to the existence of EAST1 variants . In one study, 100% of the O26, O111, O145, and O157:H7 enterohemorrhagic E. coli (EHEC) strains examined carried DNA sequences homologous to the EAST1 gene (SHEAST) with two different mutation types. Type 1 SHEAST has 12 nucleotide non-synonymous substitutions including one in the initiation codon; type 2 SHEAST lacks the first 8 codons of EAST1 sequence . The focus of the study was to investigate the astA gene sequence present in tEPEC and aEPEC strains. The strains were collected in different cities of Brazil in different periods of time and in a previous study poor relatedness was observed by RAPD analysis of 118 strains belonging to this collection . We examined 222 EPEC strains (70 typical and 152 atypical) for the presence of the astA gene by PCR using primers that anneal to the 5’ ends of the EAEC 042 astA gene sequence . Those strains were isolated from diarrheic and non diarrheic Brazilian children in previous studies [17–20]. As shown in Table 1, 11 (16%) tEPEC and 43 (28%) aEPEC strains were positive in the PCR assay. Among the aEPEC PCR-positive strains, 13 belonged to the O26 and O119 serogroups. aO2:H2;H45; O101:H33; O145:HND; O157:HND; O162:H33; ONT:H45; ONT:HND. bO4:HND; O15:HND O33:H6; O35:H19; O37:HND; O49:HND; O61:HND; O63:HND; O79:HND; O85:H40; O96:HND; O98:HND; O101:NM; O103:NM; O105:H7; O108:H31; O109:H54; O117:HND; O132:HND; O141:HND; O1523H2; O156:H16; O157:HND; O167:H6; O169:H6; O175:HND;ONT:NM; ONT:H18; ONT:HND. Note: NM, nommotile, ND, nondetermined, ONT, nontypeable. The 54 astA gene PCR products were sequenced. Twenty five strains, 7 tEPEC and 18 aEPEC, carried the DNA sequence identical to the EAST1 gene (042-type EAST1) (Figure 1). A subgroup of 7 aEPEC strains presented a variant type of the 042-type EAST1 gene sequence, with four non-synonymous nucleotide substitutions. Nine other strains, including one typical, carried either the sequence identical to type 1 SHEAST (7 strains) or to type 2 SHEAST (two strains). The remaining 13 strains carried mutated sequences of the 042-type EAST1 (five strains), type 1 SHEAST (two strains) or type 2 SHEAST (six strains) genes. Nucleotide sequences of the PCR products from tEPEC (T) and aEPEC (A) strains. The nucleotide sequences of the EAST1, SHEAST1 and SHEAST2 genes are shown for comparison. Identical nucleotides are shown as dots. Asterisks indicate the positions of nucleotide deletion. The expression of EAST1 was examined by RT-PCR and quantitative RT-PCR. The RT-PCR results showed that the astA gene was transcribed only by the strains carrying either the intact or the variant type of the astA gene sequence (Figure 2). The astA gene expression levels of the 32 RT-PCR positive strains (CT values ranged from 20.3 ± 0.11 to 21.6 ± 0.04) were nearly identical to that of EAEC 042 strain (CT value 20.8 ± 0.01). Agarose gel electrophoresis of the RT-PCR products of representative strains of tEPEC (T) and aEPEC (A). EAEC 042 strain (C+) was used as positive control. Molecular size standard bands are at left. Plasmids of the 54 PCR-positive strains were examined for astA gene presence by Southern blot hybridization with the astA probe. In 23 (42.6%) strains, a single copy of the astA gene was located to a large plasmid (Figure 3). In all the eleven tEPEC strains, the astA probe hybridized to the EAF plasmid as previously reported , and in twelve aEPEC the astA probe hybridized with large plasmids of similar size. The plasmids of the remaining strains were astA probe negative. Southern blot hybridization of the plasmids of tEPEC (T) and aEPEC (A) strains. (A) and (C) Hybridization results with the astA probe. (B) Hybridization results with the EAF probe. EAEC 042 and EPEC E2348/69 were used as positive controls (C+) for astA and EAF probes, respectively. The arrows in panels A and C indicate the pAA2 plasmid (65-MDa) for EAEC 042 strain and the arrow in panel B indicate the EAF plasmid (60-MDa) for EPEC E2348/69 strain. Molecular size standard bands are at left. We previously reported that 24% of 65 aEPEC strains hybridized with a DNA probe for EAST1 . Here, we analyzed by PCR a larger group of EPEC, including typical strains and found that 11 (16%) of 70 tEPEC and 43 (28%) of 152 aEPEC were astA positive. Sequence analysis of the PCR products showed that 7 (63.6%) of 11 tEPEC and 18 (41.9%) of 43 aEPEC had an intact 042-type astA gene. As shown in Table 2, strains carrying intact astA gene were more frequently found in diarrheic children than in non-diarrheic children (p = 0.03, Fisher’s exact test). However, we should point out that among the 222 strains analyzed only 118 were collected from a case–control study . ap = 0.03; Fisher’s exact test (diarrheic x non-diarrheic). The EAST1 gene family includes one major type of sequence, i.e. the astA of EAEC strain 042 that is widely distributed among different diarrheagenic E. coli strains [21–26] and four variant types of EAST1, i.e. the EAST1v1 of EAEC 17–2 [21, 22], EAST1v2 of EPEC N1 , and EAST1v3 and EAST1v4 of E. coli O166:H15 .In this study, a subgroup of aEPEC strains had a new variant type of EAST1 gene sequence that differed from those previously reported, and was denominated EAST1v5 (Figure 4). The RT-PCR analysis showed that EAST1v5 was transcribed to produce mRNA. However, more studies are necessary to determine whether EAST1v5 is associated with a functional polypeptide toxin. Nucleotide sequence of the EAST1 gene and its variants, including the new one described in this study. Identical nucleotides are shown as dots. The 222 EPEC strains examined in this study included 176 strains isolated in 1999 to 2004 during an epidemiological study of acute diarrhea in children <2 years of age conducted in different regions of Brazil, and 46 strains isolated from children <5 years of age with diarrhea in São Paulo between 2002 to 2003 [17–20]. All strains were characterized as tEPEC or aEPEC by hybridization with eae and EAF probes and serotyped (Table 1). The study was approved by the ethics committee of the Universidade Federal de São Paulo, Brazil. Stool samples were obtained with the written informed consent from the parents or guardians of the children. For template DNA preparation, three to five isolated bacterial colonies grown on LB agar plates were pooled, suspended in 300 μl of sterile distilled water, and boiled for 10 min. 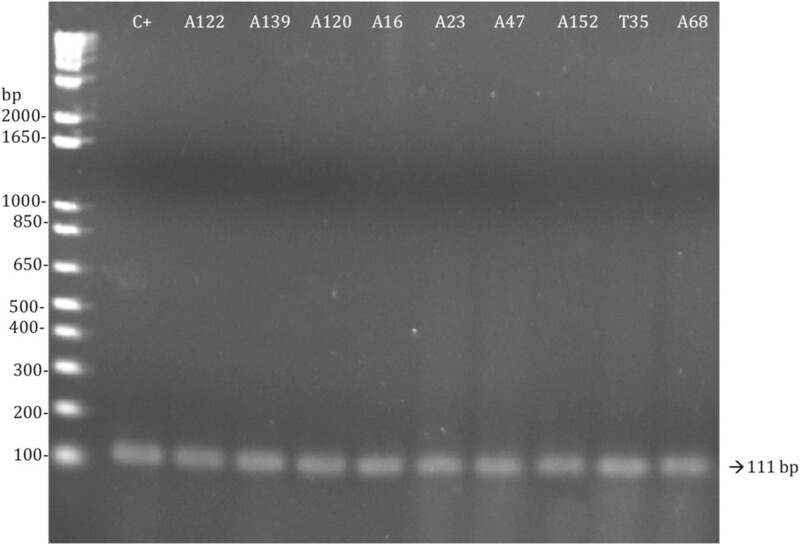 PCR was carried out in a total volume of 25-μl containing 5 μl of template DNA. PCR primers were EAST13a (F-5’AGAACTGCTGGGTATGTGGCT) located 110 nucleotides upstream from the initiation ATG sequence of the astA gene, and EAST12b (R-5’CTGCTGGCCTGCCTCTTCCGT) located 20 nucleotides downstream from the stop TGA sequence of the astA gene . Cycling conditions were denaturation for 30 s at 95°C, annealing for 120 s at 55°C, and polymerization for 120 s at 72°C (30 cycles). PCR products were analyzed by 2% agarose gel electrophoresis. The following probes were used in this study: astA, a 111-bp PCR product from EAEC 042 strain with the primer set EAST11a (5’-CCATCAACACAGTATTCCGA) and EAST12b (5’-GGTCGCGAGTGACGGCTTTGT) ; and EAF, a 1.0 kb BamHI-SalI fragment from plasmid pMAR2 . The DNA fragments were purified, labeled with [α-32P] dCTP with a DNA labeling kit (Amersham Pharmacia Biotech Inc., EUA) and used as probes. For Southern blotting, plasmid DNA was extracted using the method of Birnboim and Doly , separated in 0.8% agarose gel electrophoresis, and transferred to a nylon membrane, following a standard protocol . Blots were hybridized in a solution containing the labeled probe (105 cpm), 5 × standard saline citrate (SSC), 2 × Denhardt’s solution (Invitrogen), 0.1% sodium dodecyl sulfate (SDS), and 5 mg/ml of salmon sperm DNA for 16 h at 65°C. After hybridization, washes were done in aqueous solution with 2 × SSC with 0.1% SDS and exposed to X-ray film. Total RNA was extracted after bacterial growth in LB broth for 18 h at 37°C with the RNase Mini extraction kit (Qiagen) according to the manufacturer’s instructions. After extraction, approximately 1 μg of total RNA was digested with DNase I (Qiagen) for 30 min at 37°C, and the enzyme was then inactivated by adding 1 μl of 25 mM EDTA and heating the solution at 65°C for 10 min. To obtain the cDNA, the SperScript III One Step RT-PCR System with Platinum Taq DNA polymerase (Invitrogen) was used according to the manufacturer’s specifications. Primers for 16S ribosomal protein were used to control PCR , and the assay was then carried out with the primers EAST11a and EAST11b . PCR products were analyzed by 2% agarose gel electrophoresis. Quantitative PCR was performed in a Mastercycler ep realplex4 (Eppendorf), and threshold cycle numbers were determined using Eppendorf realplex software (version 2.0). Reactions were performed in triplicate, and threshold cycle numbers were averaged. The 50-μl reaction mixture was prepared as follows: 25 μl of Platinum® Quantitative PCR SuperMix-UDG (Invitrogen), 10 μM of the Taqman probe (5’FAM-TGCATCGTGCATATGGTGCGCAA) and 10 μM of each primer (R-5’GCGAGTGACGGCTTTGTAG and F-5’GAAGGCCCGCATCCAGTT), and 10 μl of cDNA (100 ng). The reaction consisted of: 2 min at 48°C; 10 min at 95°C followed by 40 cycles of 15 s at 95°C, 1 min at 60°C, and 1 min at 72°C. The astA expression of the tested strains was compared to the astA expression of EAEC 042, according to the formula, 2(-ΔΔCt). Nucleotide sequencing of the PCR products was performed at the Centro de Estudos do Genoma Humano-USP, São Paulo. Nucleotide sequence data were analyzed using SeqMan and MegAlign software and the BLAST tool (http://www.ncbi.nlm.nih.gov/BLAST). Data for diarrheic and non diarrheic children were compared using a 2-tailed Chi-square test. Results with p values ≤ 0.05 were considered to be statistically significant. The EAST1v5 gene sequence was deposited in the NCBI database under accession number KJ47188. This study was supported by research grants from Fundação de Amparo a Pesquisa do Estado de São Paulo (FAPESP) and Conselho Nacional de Desenvolvimento Científico e Tecnológico (CNPq). We thank Dr. Renata Torres de Souza for her help with the nucleotide sequence deposition. LEPS and TBS performed experiments and analyzed data. NPS and ICAS wrote the manuscript. All authors read and approved the final manuscript.